And then I had to laugh at myself. Because as soon as I could admit that my ego really just wanted to throw my own little pity party with me as guest of honor, I could see the pointlessness of that behavior, and how utterly true that “annoying” quote was. We exist totally separately from how we compare to others. We each exist in our own remarkable uniqueness. We each have our own voice, and adding that voice to the chorus, if we are singing true, will never be adding clutter. There are most definitely other blogs that have more impressive photography, more eloquent writing, or more creative recipes, ones that are more soul-baring, or giggle-coaxing. But this isn’t a contest. I don’t come to this space to be the best, and I don’t come to be most popular, or to get the most likes on Facebook (heck – I don’t even have a Facebook page! Which only just occurred to me last week.). I come because it makes me feel alive. Cooking and then sharing the food, whether in person or through words and photographs, is intensely meaningful to me. I love, love, love, love, to share with you lovely people, but I’d probably do this even if I were only sharing with the blank abyss of an empty interwebs. And, more than anything else, I come to this space because I care about cooking, and I want people to want to cook real food. I want people to feel like cooking at home belongs and deserves respect in their lives. I want them to try new recipes, and get comfortable cooking without recipes. I don’t care if those are my recipes (goodness knows my cooking isn’t always the easiest to follow since I frequently don’t measure anything and I almost never write a recipe down until a couple hours later, which isn’t exactly a precise cookbook-y way of doing things. But that, I think, is the openness of cooking as a creative activity instead of a hard science, something that is a thrill to learn through practice. ), as long as they try something. Thinking about this and about my tagline, “fitting real food into real life,” made me realize that a great many of our most “real” meals, the meals I concoct when I have nothing but a 3/4s bare fridge for inspiration, or the meals that are go-tos that I can make when I’m tired after a long day, those staples often don’t make it onto the blog because I think of them as too simple and it doesn’t occur to me to share them, or, even more often, because those are the days I also don’t have the energy (or daylight) left to grab my camera and document. But that’s real life, and those are some of our tastiest meals. They deserve attention. Here, therefore, is our most recent very everyday supper (well, besides the enchiladas I made last night out of leftover chili!). Though we are craving spring, it has been snowing for about the last week here in Northern Minnesota, heavy wet snow being blown by fierce winds. I think we’ve gotten somewhere close to 13 or more inches over the last several days, sloppy as wet dog kisses and far less welcome. One day I just gave up and pretended it was actually summer by making a panzanella salad with toasted bread cubes, hoop house tomatoes from Wisconsin, torn burrata, and thinly sliced basil. But, the next day it was so very cold and stormy, only comfort food would do. We nearly always have sausages in the freezer from our local smokehouse, and very often I plain old fry it up and serve it with some roasted vegetables, but that day I decided to go extra hearty and whip up a quick batter of milk, eggs, flour, thyme, and mustard to pour over them to make Toad in the Hole, classic British pub fare. What you get is browned, sizzling sausages surrounded by what is basically a giant popover, all crusty edges and soft eggy center. 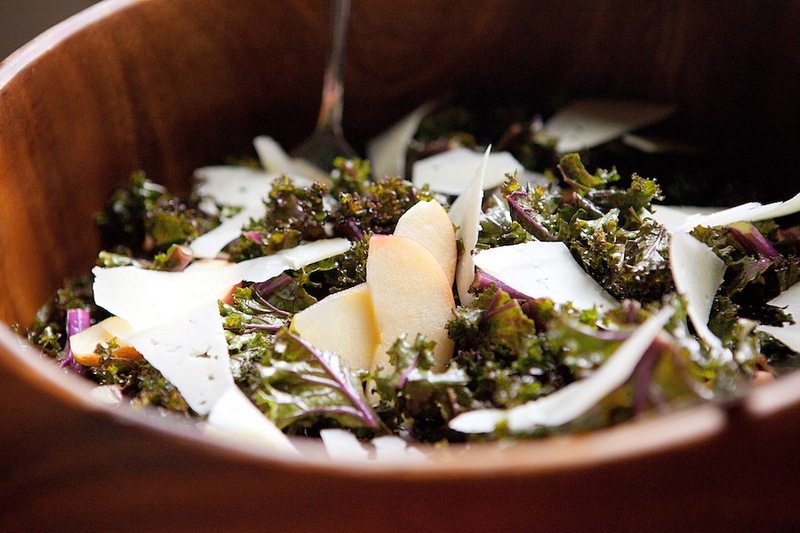 To balance out the heaviness of this main dish, I served it with this simple kale salad (kale was the only green we had anyway, and we had one sorry apple for our fruit supply). It was a perfect way to bring warmth within the gloomy weather. Heat your oven to 425F. 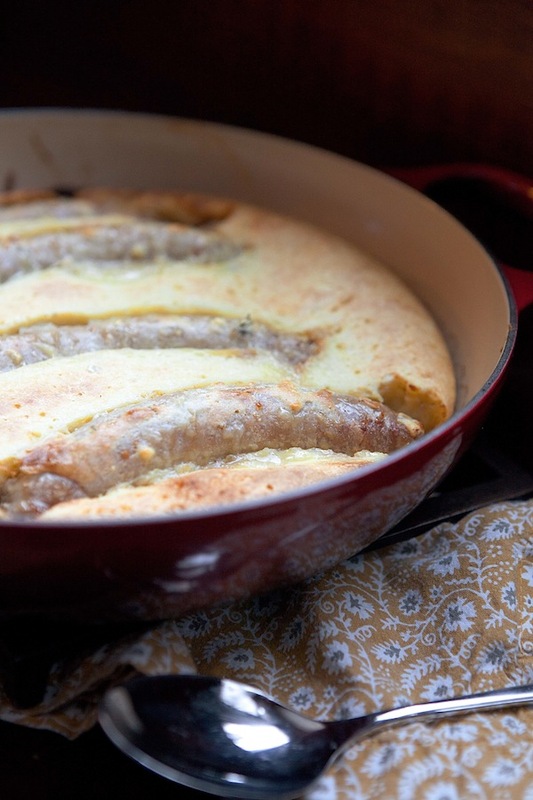 Put a heavy duty baking dish large enough to fit the sausages with at least a half-inch between each of them (about 9X9″) into the oven to heat along with it (using a hot pan is key to helping the batter pouf up around the sausages). 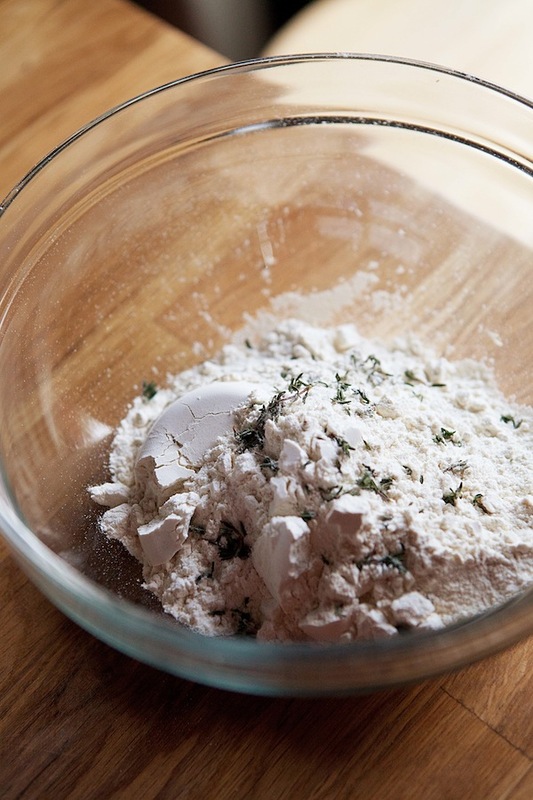 In a medium bowl, stir together the flour, salt, and thyme, plus a grind of black pepper if you wish. Make a well in the center and add the eggs. 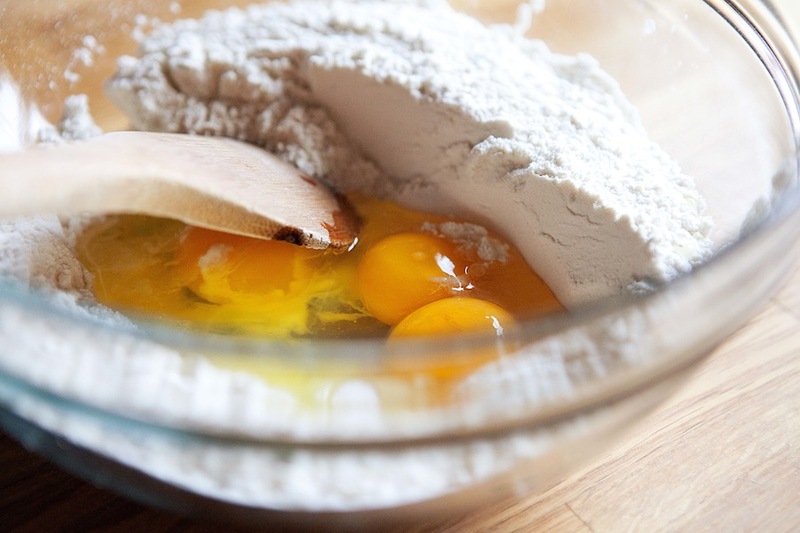 Whisk them up a bit with your stirring spoon without incorporating them into the flour, then add the milk, mustard, and melted butter, and stir everything together until you have a smooth batter. Let this rest for 30 minutes (which is about how long it seems to take my oven to heat to 425 – how lucky!). While the batter rests and the oven heats, heat a frying pan to medium-high heat and add the sausages. Brown the sausages well on their sides. They don’t need to get fully cooked through, though, as they’ll finish cooking in the oven. Add enough butter/lard/oil to the hot baking pan to coat it and shut it back in the oven until it is smoking hot. Pull it out and put the sausages in it. Then pour the batter over the sausages and return the pan to the oven. (I actually used the same pan I fried the sausages in to bake the whole dish since it was oven safe. I made sure to get it very, very hot while I was cooking the sausages. 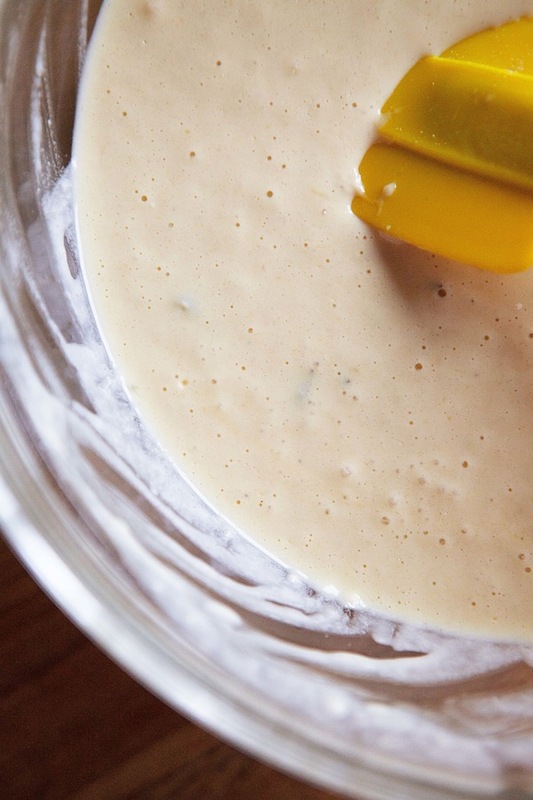 Doing this saves you a dish, but the batter may not be quite as puffy.) Bake 25-30 minutes until the batter is puffy and golden on top and crisp around the edges. Don’t crack open the oven to check until it’s been at least 20 minutes because, like with a popover, the batter can be a little testy and deflate if you hover and check on it too soon. Serve the toad in the hole warm accompanied by a salad. If you want to get seriously British about it, you can also serve it with a gravy of caramelized onion that has been made saucy with some stock and Worcestershire sauce, but I never bother. Lovely thoughts. Thank you for sharing your voice and your recipes. And, as a former Bostonian who celebrated every marathon day, my heart is breaking right alongside of you for everything we lost today. Thank you. I know Boston, and all of us, will come back as strong as ever, but I think it is also right to feel heartbroken for the loss. A beautiful post, Emily – I look forward to seeing your new site and I certainly appreciate all you share here. I am deeply saddened and shocked by what happened in Boston today. I have friends who live along the marathon route, and when I lived in Boston I watched and cheered during this joyous time. Sigh…lots of tears now. I hope all of your friends are doing alright, and you as well. You’re all included in my thoughts and prayers. My thoughts immediately went to you Emily, I know you were in Boston. My heart is broken for all those injured and those that lost their lives. I am just broken hearted, be strong. Thank you so much for thinking of me Suzanne. You have no idea how much that means to me. We all need strength right now. It’s really sad. I didn’t realize you are in Boston. The city will definitely heal, but I hope they bring the people to justice quickly. 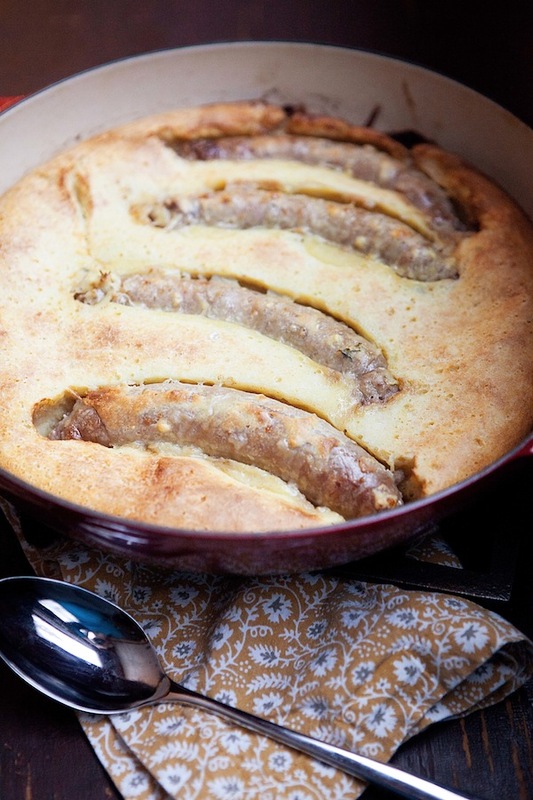 Love your toad in the hole! Thank you chef mimi. I lived in Boston for almost the last 8 years. We just moved to Minnesota this fall. It feels so odd to be removed from something that we are at the same time so close to you. I do absolutely know that the city will heal. And I’m sure that the marathon, in the future, will be more joyful than ever. That’s the real way to fight back. ugh, i’m in boston and it’s a very tough place to be today. on a different note, i am looking forward to more of these “every day” recipes! thanks. Hugs to you Vanessa. I hope you’re doing well and recovering from all the shock and sadness. I know you weren’t fishing for compliments when you wrote this, but I have to tell you: your writing is the best. The best! I always set your posts aside to read, to actually read, because the way you write deserves my full attention. I wish I was half the writer you are. I can’t wait to see the redesign; I’m sure it will reflect you and your voice. I am so glad your loved ones are safe in Boston. My mind is numb thinking about what happened there today. Thank you so much Brianne. That’s really so kind. I guess it could seem like I was fishing for complements – oops! 🙂 I just wanted to be honest about my process, and I know everyone who reads understands that. But, thank you, thank you for reading. And, I can’t wait to share the site redesign. It’s seriously so exciting! yes an act of terrorism with the intent of inducing fear – so sad and disquieting. i’m not sure what else to say or what can be done to combat that “darkness”…..
thank you for all your lovely post including this one. i do very much agree with your underlying philosophy regarding cooking and making it a valued and important activity. The simpilcity and “earthiness” of your recipes is inspiring. please do keep posting…. just wanted you to know that your blog is one of the most inspiring for me out there and I´ve been reading a lot of food blogs. I love your pictures as much as your beautiful writing (you can describe a dish with words so well that I can almost taste it by just reading about it!) and I am always looking forward to every new post. Just like Brianne I would never read one of your articles on a rush, I always set it aside and wait for a calm moment to totally dig into it. Thank you so very kindly! You’re so sweet to say that. And, yes, don’t let yourself get into the competition mindset and drag yourself down! As long as you care about what you’re doing, keep doing it! I ended up in a similar situation – writing a post before the tragedy. I know what you mean about the nervousness of being a blogger, with so much already out there. But your site is quite lovely. Keep doing what you do, if you love it. It’ll make sense. And congrats on moving over. I’m doing it myself (to my own site/domain name) – and it’ll be wrapped up next week. It feels like a bit of a commitment to the blog, doesn’t it? I think that’s a good and great thing. It does feel like a big commitment, but it’s very exciting, and a long time coming. Congratulations and good luck on your move too! The scenes from Boston are just awful and heart breaking. I can’t imagine what it must feel like to know the city so well and to feel under attack. Within this new and terrifying reality of ours though, we have to find time to eat. That is what I find so inspiring about your site, how you do manage to, as your tagline suggests, fit real food into real life. It’s always a joy to visit here. Thank you so much Kathryn. You’re so right, we do need to find time to eat. And, I really do believe that if we use that time to put care into nourishing ourselves and others, then that is a very important act of creating and of exerting the positive side of humanity. I’m awfully good at doing the comparison/bemoaning my lack of creativity-awesomeness-etc. Meaning I really appreciate the quote you shared and your ability to step back and realize it isn’t a competition. Thank you. Also, your writing is just wonderful. Every post, I admire it and enjoy reading. It’s such an easy thing to slip into, isn’t it? And it becomes a habit of the mind that’s hard to break. Definitely remember that quote, even when it seems cheesy, because it’s true. Keep adding your voice! Emily, I think the same things about myself sometimes when reading blogs like yours! Such beautiful photos, so well-written, such experience and knowledge that you share with us. I try to use the feelings it gives me to propel me to keep improving my blog. Either way, I love reading along here and have made many of your fabulous recipes! I’m making a repeat double-batch of your amazing orange cardamom yogurt cake tonight, in fact. SO yum! This inspires me to post more of our down-home, every-day recipes as well. Even when I feel too tired to shoot. I didn’t yet congratulate you on your exciting news! I’m so impressed at all you continue to accomplish, despite your different level of energy. And I agree with your words regarding the events in Boston. Having received news of a friend’s death in a separate circumstance this weekend, my heart is broken for so many. Oh, I’m so sorry to hear about your friend. I’m sending you lots of positive vibes to get through all of the circumstances and to feel peace. And, definitely never ever let a comparison with other people or blogs get you down. Your blogging is awesome! (And, if you ever want to feel really good about yourself, go look at m early posts. It’s a good reminder – one I need to give myself- of how far someone can come through work and determination). And thank you so much for your congratulations! We’re thrilled, and it’s starting to feel quite real now as I get a good sized bump and dont fit into my clothes anymore. Hugs to you and yours. Yes! You have your own way of seeing and doing things that’s totally unique. So do bother. Go for it! You are currently reading Vær så god: Toad in the hole with kale salad at Five And Spice.